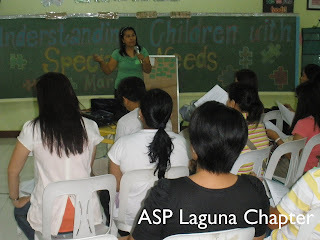 Last March 10, 2012, ASP-Laguna Chapter conducted a seminar entitled “Understanding our Children with Special Needs” at Holy Rosary College – Special Department in Sta. Rosa, Laguna. This was in response to the school’s request for a parenting seminar for parents, grandfather and grandmother, and caregivers of their students. The seminar was divided into two sessions. The morning session is composed of parents whose children are 7 years old and below. The main concern of this group revolved around the challenging behaviors displayed by their children and the difficulty in using language at home and at school. 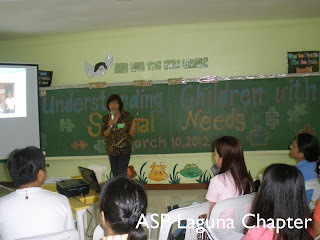 The afternoon session was for parents having children whose are 8 years old and above with different disabilities. Living skills and independence at home and school were the main concerns of this group. 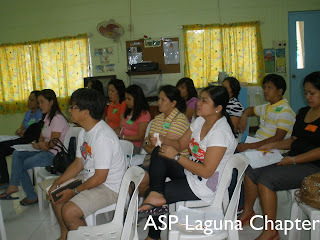 The seminar attended by 27 parents and 9 staff was facilitated by five ASP Laguna members and Autism Resource Center (ARC) staff namely Riza Cansanay, Lian del Valle, Vay Chavez, Jerome Nicolas and Lui Mansit. 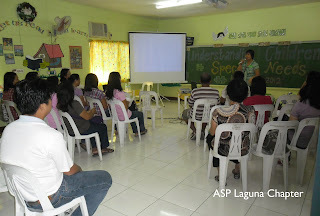 Thanks to ASP Laguna chapter for their continuous effort to empower families, professionals and the community. You can contact the ASP Laguna Chapter President Rizalinda Cansanay at (0918) 577-7940.